[Stride]-Stride Step-[Choose one or more cards with the sum of their grades being 3 or greater from your hand, and discard them] Stride this card on your (VC) from face down. [AUTO]:[Soul Blast (1) & Choose a face down card from your G zone, and turn it face up & Choose a card from your hand and drop zone, and return them to your deck] When this unit is placed on (VC), you may pay the cost. If you do, choose up to two cards from your hand, and call them to separate (RC). 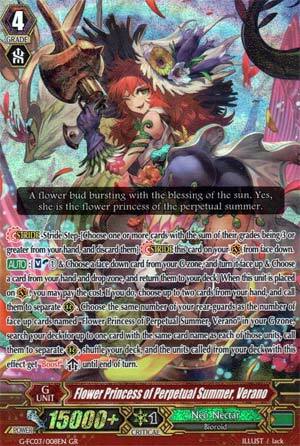 Choose the same number of your rear-guards as the number of face up cards named "Flower Princess of Perpetual Summer, Verano" in your G zone, search your deck for up to one card with the same card name as each of those units, call them to separate (RC), shuffle your deck, and the units called from your deck with this effect get "Boost" until end of turn. They needed this G Unit. Verano, when placed on VG circle, Soulblasts 1, flips a G Unit face-up, and sends a unit in the drop zone and hand back to the deck. You then call up to two units from the hand, then for every face-up Verano in the G Zone, clone one of your rear-guards, and then the clones gain Boost until end of turn. This card exists to sort of fight back against Kagero. You're supposed to Stride this out to gain a field, then you'll have targets to clone with Ahsha's skill. That alone makes this card worth running. Apart from that, it could do with a better finisher, but since the rear-guards in G Neo Nectar are pretty good at columns without the vanguard's help, you can certainly do worse. Only necessary if you find yourself getting constantly board-nuked, otherwise Glorious Bloom Ahsha is the better finisher. Okay, so, Verano is probably the first unit I've ever seen with her back to the viewer. Load the field and all units that you call with her skill can boost? Um, okay, grade 3 boosters is always fun! Also, is that a water pot gun in her hand? Awesome. Whew, went the whole review without mentioning "Dat arse". That was hard.